Paradise fish are anabantoids, which means they can breathe atmospheric air, other anabantoids include Siamese Fighting Fish and Gouramis. Being anabantiods they are well equipped to flourish in environments where most other fish would die. Their labyrinth organ enables them to live in stagnant low oxygen water. I’m not suggesting you should keep them in dirty water on purpose, but in other ways you should try to mimic their natural environment in order to get the best out of them. In the wild, the waters they live in would have little or no natural water current. 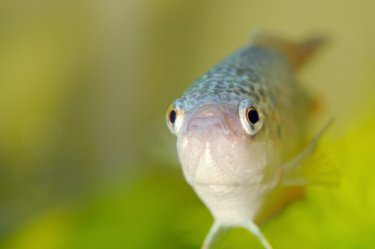 In the aquarium environment they will struggle if you use power filters, their bodies are not designed to cope with the fast movement these filters produce. Similarly you do not need to include air stones or other air pump powered accessories, they will provide no benefit to Paradise fish. Like Siamese fighting fish, Paradise Fish do not need a vast amount of space, in fact many people keep these fish in a simple goldfish bowl. Personally I don’t like the idea of putting these fish in goldfish bowls, at the very least fish need to be a tank with a filter of some sort, even if it’s just a foam filter. These fish will benefit from a well planted tank. 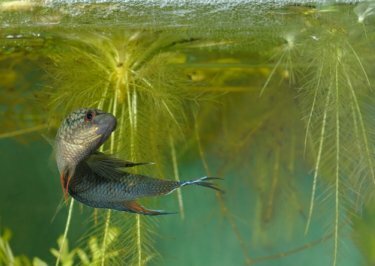 Floating plants are a really good idea as they can use to support their bubble nests when breeding. Like most fish, they will accept flake food, but to help bring out their beautiful colours you should feed a range of different foods. They love all live food. In the wild they would eat mosquito larvae, but any live food will do, including bloodworm and brine shrimp. 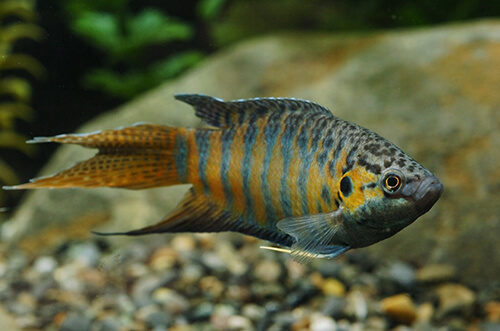 Paradise fish breed in the same as other anabantoids. The male builds a bubble nest to attract a female. The male will guard the eggs in the bubble nest until they hatch. 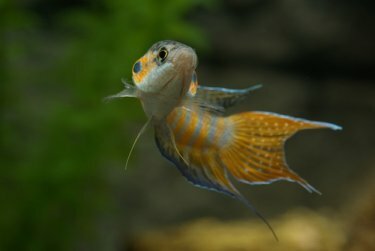 Males do have a reputation for being a bit aggressive with other community fish. These fish like jumping out of the water and have been known to jump out of the aquarium, so a secure lid is a must.